Emergency services were called to the blaze in the Highfields area of Stafford at 2.40am. THE FOUR CHILDREN who died in a house fire in Staffordshire in the UK overnight have been named by police. Police confirmed that four children lost their lives in the fire. The children have yet to be formally identified but police said they are believed to be Riley Holy (8), Keegan Unitt (6), Tilly Rose Unitt (4) and Olly Unitt (3). A woman aged 24 and a man aged 28 escaped the fire with a two-year-old boy. All three are in hospital, but their injuries are not life-threatening. The man is being treated for burns and the woman is being treated for smoke inhalation. Fire and rescue services are examining the scene as the investigation into the cause of the fire begins, police said earlier. “I want to reassure you we are working closely with colleagues from Staffordshire Fire and Rescue Service as investigative work into the cause of the fire begins,” Staffordshire Police chief inspector Gemma Ward said. “We would like to offer our condolences and thank the community for their support, as I’m aware groups and individuals have already been offering aid,” she said. Email “Four children who died in house fire in Staffordshire in UK overnight are named”. 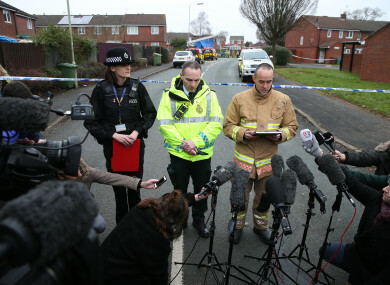 Feedback on “Four children who died in house fire in Staffordshire in UK overnight are named”.